Give the gift of hot cocoa to the entire family with this allergen-friendly mix. 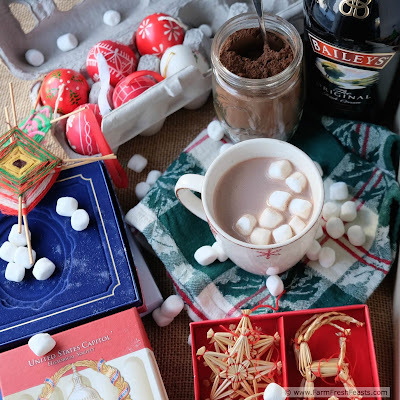 Add a bottle of the spike of your choice so that the entire family can enjoy a treat. This post is the start of #ChristmasWeek, a sweets-filled extravaganza hosted by Kim of Cravings of a Lunatic and Kiss My Smoke. Note: I am taking a break from my usual routine of posting recipes using local produce from my Community Supported Agriculture (CSA) farm share, the farmer's market, and the garden. If you've got a pile of veggies you're looking to use, may I suggest checking out my Visual Recipe Index by Ingredient? Does this photo look like the chaos that ensues during tree trimming time? It's supposed to. Or maybe that's just my house. I'm going to come across as a total booze hound in this post and I apologize in advance. I know that turning to alcohol will not solve any of life's petty little annoyances nor cure any chronic behavior issues. I know that alcohol is not a long term coping solution for any of life's stressors. If you are concerned about giving a gift with alcohol, please feel free to substitute any of the flavored syrups posted below as your spike of choice. Those flavored syrups are going in our Christmas stockings (and hopefully my kids aren't reading this). With that caveat out of the way . . . it can be pretty damn hard to solo parent teens, or really kids in general, and the extra activities of the holidays make it doubly hard. Please consider giving the gift of a jar of Spiked Hot Cocoa Mix to anyone you know who would enjoy it--even yourself. 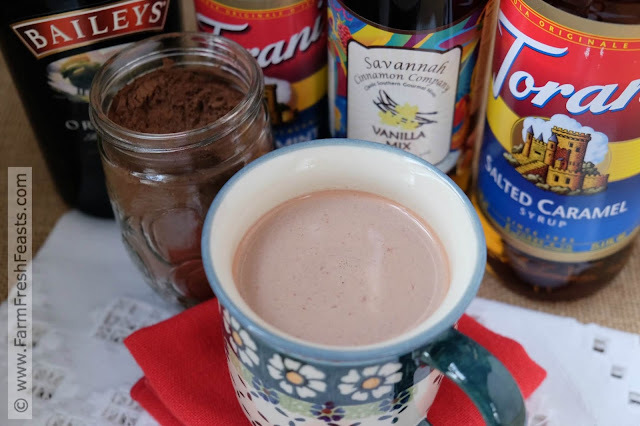 What a wonderful way to unwind after a busy holiday than with a cup of hot cocoa--spiked with a little something for mom & dad, [mom & mom, dad & dad, solo parent] left plain for the kids. I've had such fun working on this recipe and I looked forward to my nightly recipe testing! 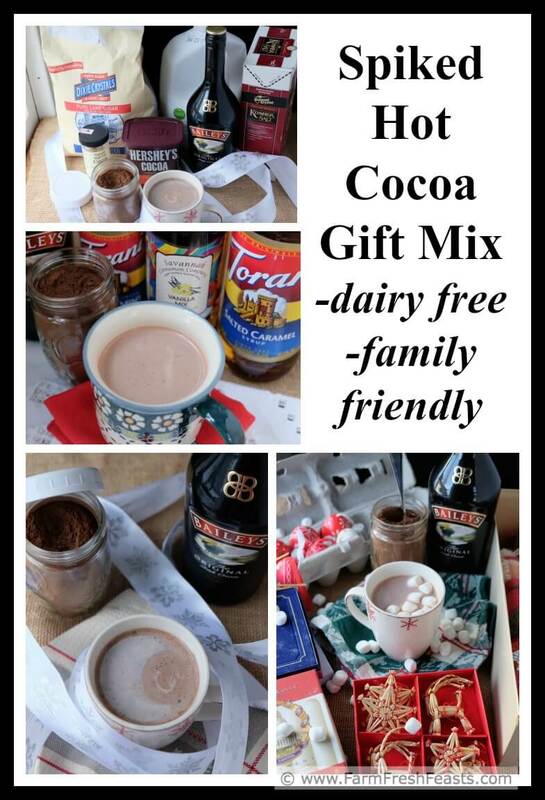 You'll notice a couple of subtle changes from the standard hot cocoa gift mix recipe. First off, there is no powdered milk in this recipe. That means you need to get to mix it with the milk of your choice. An extra step to be sure, but I have my reasons. I grew up drinking the occasional milk-stretched-with-powdered-milk and personally can't stand the taste of reconstituted milk. I'll bake with it no problem, but I will not drink it by choice. I'd rather literally walk a mile down the street to pick up a gallon of organic milk for me and my kids. [It's good exercise for the dogs, too.] If you have a dairy allergy or are avoiding cow's milk, this mix is for you as it is dairy free. Please feel free to mix up your hot cocoa with the rice, soy, or nut milk of your choice. The second difference is that you're not going to see a cute little bottle of booze tied with twine to the jar. I love me too much not to shell out $16 for a full size bottle, good for many servings. Aren't your recipients worth it, too? 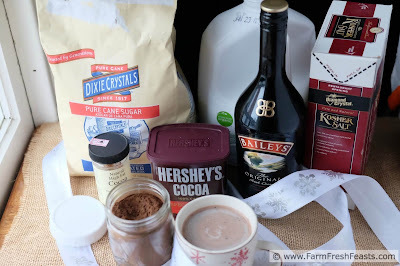 What if you don't even want the hassle of mixing up hot cocoa mix? Hit the grocery store and pick up a canister of store brand chocolate milk mix and a large bottle of Bailey's or Peppermint Syrup. It's the thought that counts, after all, and you'll get no judgement from me. After all, I post my failures right up on my FB page. I shudder to think what Pinterest fails I'd get up to if I had access to twine. As this is a relatively easy holiday gift idea, I thought it would be a nice kick off for #ChristmasWeek. Since I've been baking (and eating, and delivering baked goods) for the past few weeks, I'm able to start of the week with a collage of all the recipe I'm bringing to you. Check 'em out! Welcome to Day 1 of Christmas Week. This annual event was started in 2012, and is hosted by Kim of Cravings of a Lunatic. This year we have over 35 bloggers sharing festive sweet recipes for the event. In a large bowl, whisk together all ingredients. Watch out for flying cocoa! Transfer to the storage container of your choice. I used my canning funnel but a rolled up piece of paper would do the trick. This nicely fills a 12 ounce jar, and nearly fills a pint size jar. 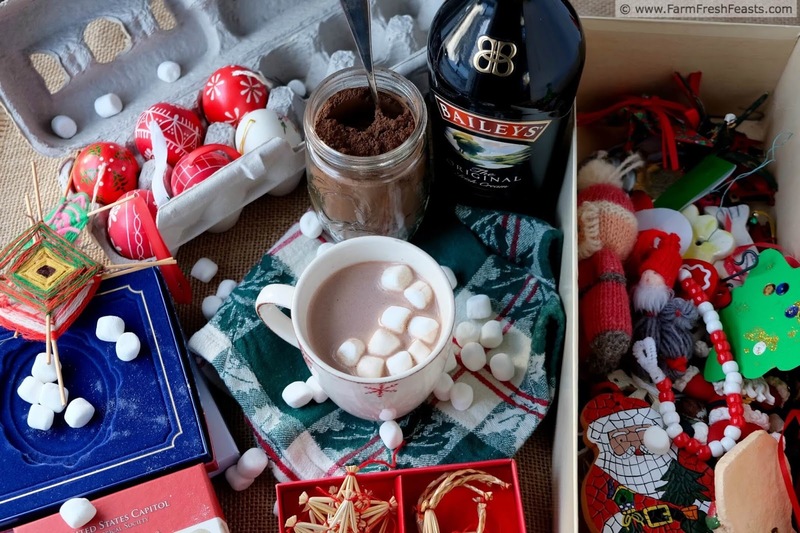 (You can always throw mini marshmallows in to fill the space). To serve, spoon a couple of heaping soup spoons into the mug of your choice. Add a bit of milk of your choice, about ¼ cup, and stir well until the cocoa powder is dissolved into a rich dark color. Add in more milk, then microwave at full power for a minute. Stir, then microwave another 30 seconds or so at full power until you like the drinking temperature. Stir in a splash of the 'spike' of your choice after heating. Enjoy! And now, for a wee bit of behind the scenes. It was a bright afternoon when I was scurrying around to get these bottles of flavored syrups photographed and hidden away before the kids got home. To decrease the glare on the bottles I held up a piece of black foam core against the window. The result is more detail, seen in the right hand side photo. Such a yummy treat, and so customizable! I had some with rice milk last night as we're out of cow's milk. Delicious! This would be great to mix up a bunch for a massive pile of gifts--with an assortment of Spikes (always at least 1 more than the people present) everyone gets a choice. [Says the woman with 4 dog beds and 3 dogs, who had 3 guinea pig hidey houses for 2 guinea pigs. I'm big on choice.] 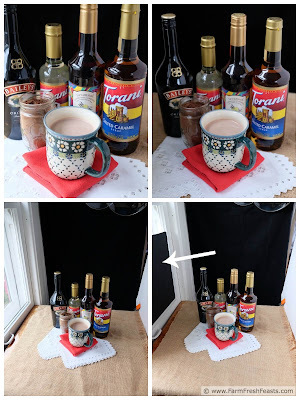 I saw many flavors of Kahlua that would be yummy, and I've got my eye on that salted caramel syrup. I love all your icons--that's so cute! This time of stroking bottles of booze will surely pass. At least they have a nice, smooth, feel to them. Next Christmas, though--momma would adore a little nip to her cocoa! LOVE that you did not include powdered milk in your recipe. I have way too many childhood nightmares from that taste! Maybe we had the same drinks! I can't fault our folks for trying to economize any way they could, but oh the taste memory lingers on. Sigh... I'm not a solo parent and I KNOW how difficult it is to parent teens. Sometimes I want to run away and come back in 2 years. But I won't. 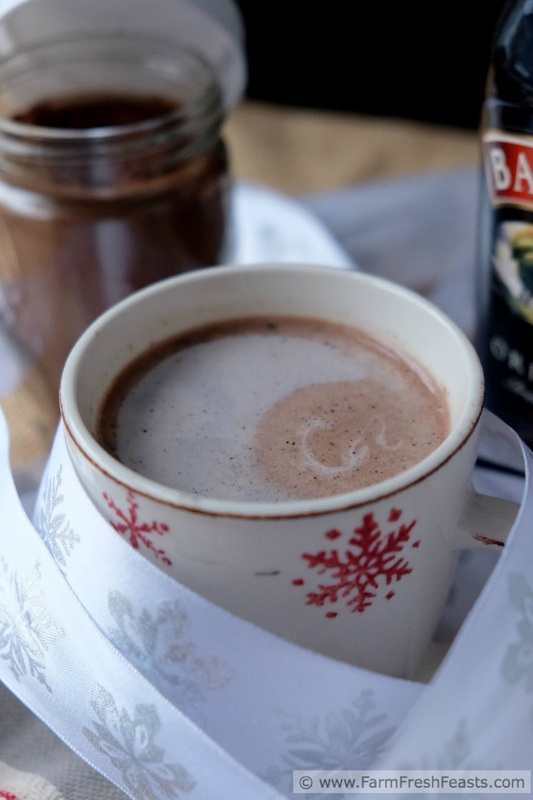 Instead I'll escape every once in a while with this spiked hot cocoa. P.S. I'm with you.I love me too much to not spend the dough on a full sized bottle! Sometimes, the little escapes are all you need to recharge and refresh! Just want to let you know that I actually made a batch of this for last minute gifts this year (minus the booze). I chose your recipe because it did not have the milk and I do have several friends whose children cannot drink milk. You never know anymore who will have allergy issues so, to me, it is worth it to be safe with everyone! Thanks for the recipe!! I made my mix for my family for gifts the other day. Mine is similar to yours, no powdered milk!!! I also never understand why people don't include salt in theirs, salt helps bring out sweet. Not sure some people are aware of that. Wish we lived closer so we could make hot cocoa, gossip and giggle. Thanks for joining us for Christmas Week. Thanks for hosting with such flair! That sounds wonderful to me!